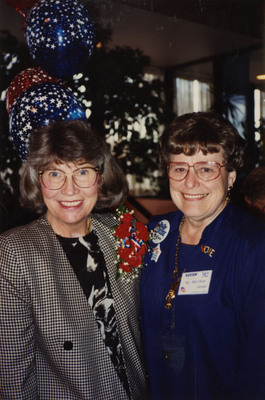 Picture of Rosemarie Myrdal and Alice Olson attending a 1992 North Dakota Federation of Republican Women event. Alice Olson is wearing a "Bully Bush" button and a "VOTE" pin. A fellow Republican, Alice Olson served together with Rosemarie Myrdal in the North Dakota House of Representatives to represent District 11, and later District 10 (Cavalier County). Olson was elected in 1972 and served for 26 years until her retirement in 1998.